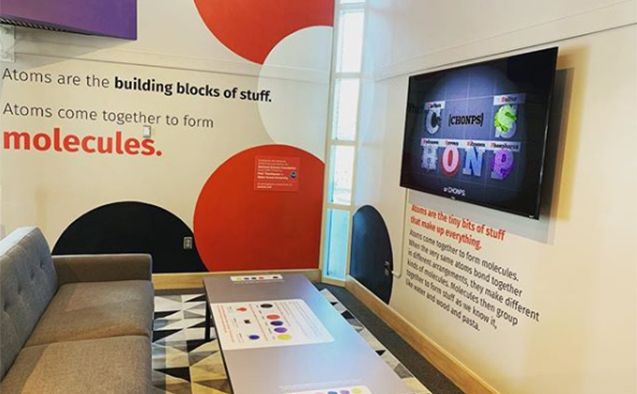 Budding scientists of all ages can now learn about nature’s microscopic building blocks, thanks to a new exhibit that recently opened at Kaleideum North. Molecules offers visitors the opportunity to explore the world of atoms – the tiny bits of stuff that make up everything. Molecules is the result of a collaboration between Wake Forest University and Kaleideum – created as a part of an education outreach component from a $330,000 National Science Foundation (NSF) grant Associate Professor of Physics Timo Thonhauser received through the NSF’s Condensed Matter and Materials Theory program. NSF’s mission is not only to support cutting edge research, but also to educate the next generation of scientists. 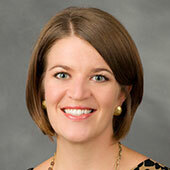 Thonhauser worked closely with the museum on exhibit design. “Kaleideum is an amazing place in our community where we can have this perfect intersection of research and scientific education, and we can then help improve the scientific literacy of our kids and larger community,” Thonhauser said. The exhibit features Snatoms™, a molecular modeling kit that uses magnets to snap “atoms” together to form “molecules.” Participants can sit on the exhibit’s couch, lounge on the carpet next to the coffee table, or perch at high tables to work together and build Snatoms™ into models of molecules, whether it’s water, ammonia, methane, or any number of other options. The table also includes instructions and some background, as well as diagrams of assembled molecules, to help kids get started. The exhibit also features a TED-Ed video about the science behind molecules, with subtitles in both English and Spanish. Did you know that the atomic makeup of macaroni salad and gasoline are not that different? The entertaining animation gives an understandable and accurate explanation of how the same atoms can be rearranged into very different substances that can fuel a body or a car. 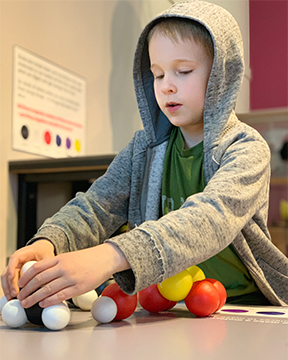 “This exhibit allows families to explore the concept of molecules in a casual, yet credible, way that inspires everyone to learn more about the world around them,” said Harshaw. State and regional planners have called for collaboration between universities and museums to enhance education in the physical, engineering, and life sciences by improving student involvement in activities that build interactive skills, stimulate creativity, and increase motivation to stay in school. Involvement with science and technology in informal, voluntary, and self-directed settings — such as museums and science centers —gives visitors the flexibility to pursue and develop their own interests and the motivation to seek additional education. Informal science education is considered one of three vital pieces of the U.S. education system (within K–12 education and higher education) necessary to ensure the future ability of the nation’s educational institutions to produce citizens literate in STEM. 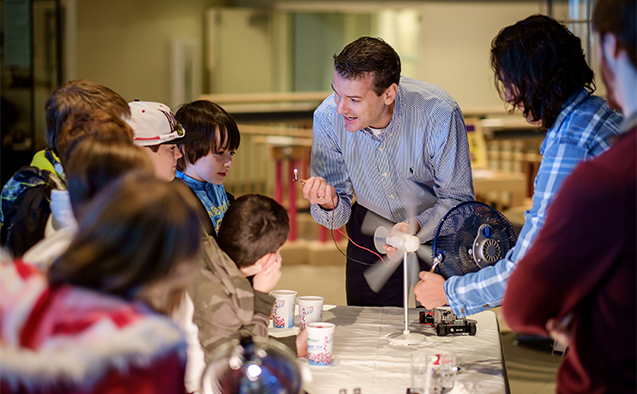 Thonhauser and graduate students demonstrated alternative energy sources to elementary school students at SciWorks (now Kaleideum North) in 2014. Now that the exhibit is installed, a research group comprised of students and post-doctoral researchers from Wake Forest will volunteer at Kaleideum to support the exhibit. They will answer questions related to the displays, participate in sessions with schoolchildren, engage in informal conversations, and make public presentations. 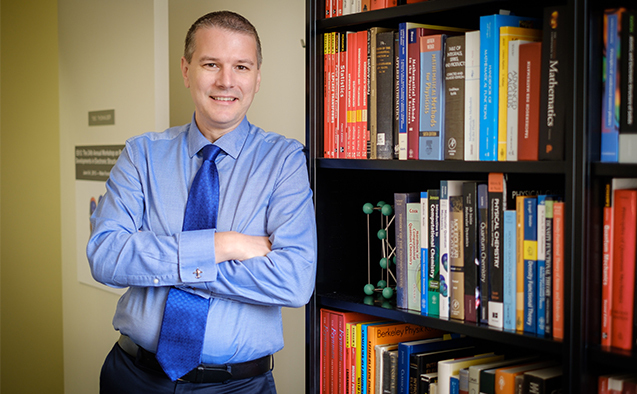 “We know that informal science learning leads to further inquiry, enjoyment, and a sense that science can be personally relevant and rewarding,” Thonhauser said. Kaleideum North is located at 400 W Hanes Mill Road in Winston-Salem, North Carolina. For additional information about the museum, visit kaleideum.org.